It's Muffin Tin Monday, and the theme is Big and Tall, Short and Small. We added an additional theme this week. It's called the I-Don't-Want-to-Wait-A-Year-To-Use-the-Awesome-MTM-Stuff-I-Got-On-Christmas-Clearance Theme. Indeed, I found cute snowmen and gingerbread picks on clearance at Kroger for 50 cents. And I found present shaped muffin tin liners at A.C. Moore for $3.99. Pierce had two BIG and TALL turkey/cheese/bacon/mustard/pickle sandwich stacks. He loves this combination and never leaves behind as much as a crumb. And I'm happy to have found a sandwich he loves so much that is quick to make. Peas and peaches are SHORT and SMALL. Pierce ate all of these too. I love your club sandwiches. I won't want to wait to use your cool muffin tin items either. Hee hee - I like your additional theme! :o) Don't forget you can use the super-cute present-shaped cups on birthdays too! OH! I love this! the gift tins are sweet-- great for a birthday too! Our tin today is a birthday tin... for our dog! LOL!! love your muffin cups! I saw those at Target too...so cute! I love your Don't-Want-to-Wait-A-Year-To-Use-the-Awesome-MTM-Stuff-I-Got-On-Christmas-Clearance Theme. Very fun! Happy Monday! It's all in the presentation! Kids and adults love foods that are pleasing to the eye - kids like it to be fun and we like it to be colorful and fresh looking - nice packaging, mom! That was just too cute to wait until next year to use! You can use the presents for birthday's too! Can't wait to see what you come up with next week. 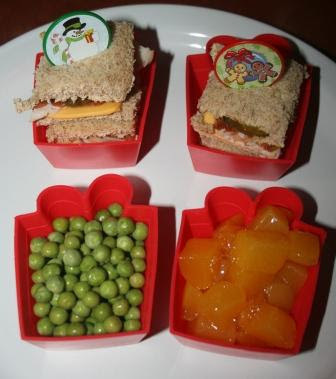 Your kids get to eat the neatest meals! I used mine after Christmas too! I used the trees in a "Winter theme' and the presents to make cupcakes for my sister's January birthday! But I would totally have found an excuse to use them for MTM too! Maybe we should do a Christmas in July theme! Hi! I wasn't quite sure how else to contact you (did not see your email here) but wanted to let you know that I saw your tweet regarding needing a blog designer for some changes. My design site is: http://deluxeblogdesigns.blogspot.com and I'd be happy to work with you on any changes! LOL love the theme name, I would be using those right now too, they are so cute! Your mini sandwiches sound good! Also I like your little red muffin tin liners! Very cute!